The complimentary Wi-Fi and breakfast 24-hour gym and work center and I-5 spot near shopping and sporty sites are some of the handy features of the non-smoking Best Western Woodburn. The three-story Best Western houses 80 non-smoking rooms featuring free Wi-Fi mini-fridges microwaves coffeemakers and cable TV. Complimentary continental breakfast is served daily. There is 24-hour access to the fitness room and business center. 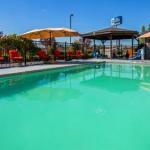 Enjoy a soak in the heated outdoor pool and hot tub open seasonally. Pets are welcome for an additional fee. Parking is free. This Best Western lies across I-5 from the Woodburn Company Stores and one hour west of Mt. Hood National Forest. Downtown Portland sites including the Portland Art Museum are within a 45-minute drive north. The Woodburn Dragstrip is less than two miles away. The hotel also lies within eight miles of the Wooden Shoe Tulip Farm and 41 miles south of Portland International Airport.